Since Romney’s performance in the first presidential debate, Obama has held onto the lead in just one of nine national polls. But this morning’s NBC/WSJ/Marist and CBS/NYT/Quinnipiac polls add additional data to what had been an emerging trend: Obama’s resilience in the battleground states. The six battleground state surveys showed Romney gaining an average of just 1 point since the first presidential debate and maintaining a lead in the pivotal state of Ohio, where NBC/WSJ/Marist found the president maintaining a 6 point advantage, bolstered by 63-37 lead among the 18 percent of voters who said they had already voted. At this stage, it appears that Romney made smaller gains in the battleground states than he did in the national polls. On average, Romney gained 2.1 points in battleground state polls, even though he picked up an average of 5.5 points in the 11 national surveys conducted after the first presidential debate. Given Obama's pre-debate leads in the key battleground states, a 2.1 point gain would leave Romney well short of 270 electoral votes. In fact, Obama led by more than 4 points in states worth 281 electoral votes. 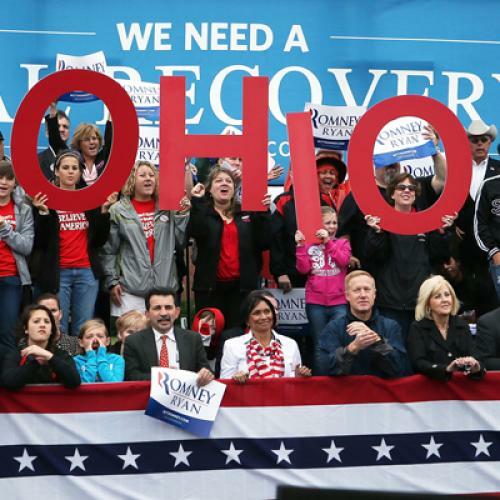 In particular, the Romney campaign should be distressed about Ohio. Even at what could very well be Romney’s peak, Obama leads in six of eight post-debate surveys in Ohio with CNN and NBC/Marist both showing Obama up by more than four points. On average, Obama leads by 2 or 3 points in Ohio, but right now it would be sufficient to reelect the president despite Romney’s lead in the national polls. And although some argue that Romney could win without Ohio, it’s not clear that his other routes to the presidency are much easier. To win without Ohio, Romney would need to win Wisconsin or both Nevada and Iowa, let alone the other three tipping point states that each look like coin flips. But Obama is above 50 percent in Wisconsin and Democrats decisively won the voter registration war in Nevada, where Romney hasn’t led a single survey during the general election campaign. Are there reasonable explanations for the gap between national and state polls? Nate Silver has covered a few explanations, but here's a more speculative possibility--and it is just a possibility. Simply put: campaigns might matter. There hasn't been a campaign where the battleground states have endured so many advertisements for so long before the rest of the country even began to tune in. This was also a campaign where the conventional wisdom has long held that attacks on Romney did alot of damage, especially in Ohio. While most of the country tuned in and saw Romney unadulterated by months of advertisements, voters in the battleground states might have more entrenched and cynical views of the Republican nominee. Relatedly, there might just be fewer undecided or weak supporters in the battleground states than there are nationally, in part because they've been thinking about this longer. It's even possible that Democrats might be more enthusiastic and energized in the battleground states than they are nationally, which might leave them better positioned in likely voter models. Next weeks polls could bring the state and national numbers back into alignment and all of this will be forgotten. But for now, Romney seems to have a battleground state problem. It's not just that he trails in states exceeding 270 electoral votes, it's that he trails while appearing to lead in the national polls. Could Romney make additional gains? Yes. But Romney is coming off of a historic debate victory and is currently doing as well as he's done the entire campaign. Given the favorable circumstances, it seems fair to at least wonder whether Romney will be able to take a lead in Ohio by November if he can't close the gap now, provided that the national race stays close.